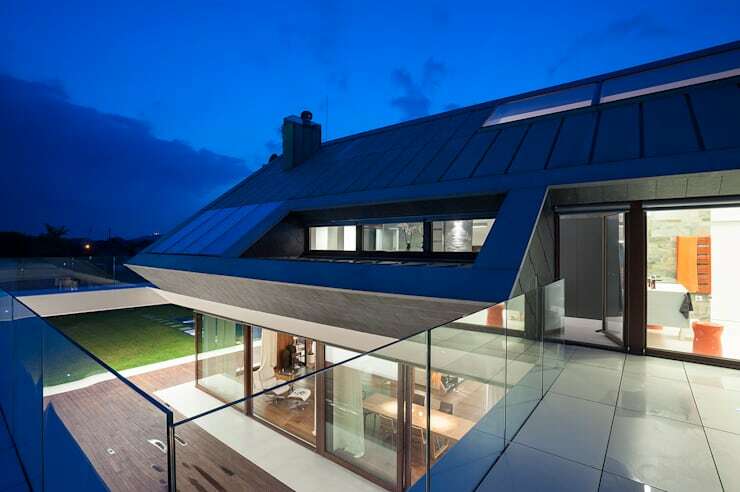 A contemporary house with real EDGE! 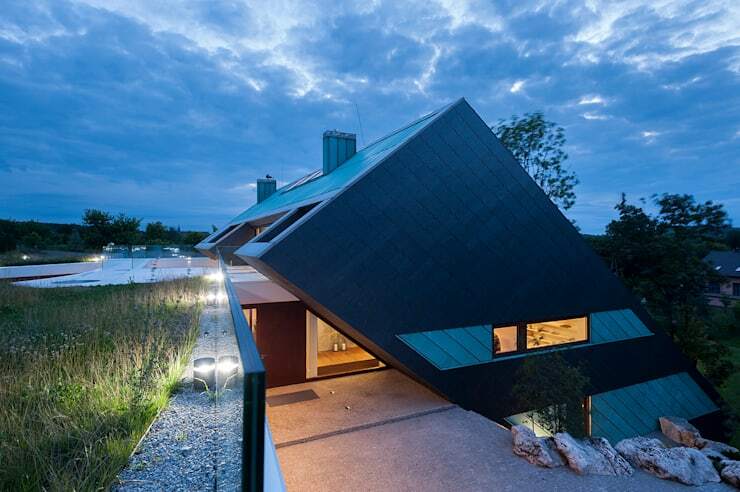 When we show you the pictures of this incredible home, you'll understand exactly why the architects named it Edge House. A cacophony of seemingly illogical shapes, all intertwined, this is a home with many levels, as well as layers and the finished aesthetic is one that you wouldn't be able to get a firm handle on, even if you had a lifetime to do so. We have to say that we have rarely seen a home so unusual or perfectly executed, but as well as boasting enviable good looks, there is an inherent functionality to this property that is impossible to ignore. 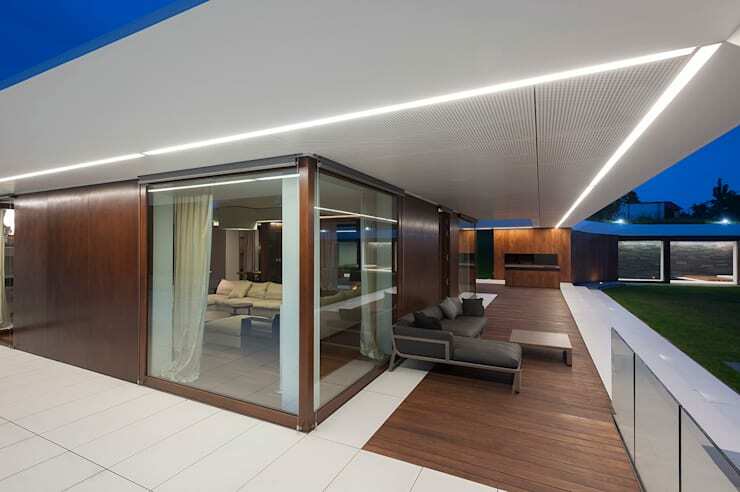 All balconies, terraces and walkways are privy to their own doors, to maintain full contact with the garden, but it's the enormous living room, suspended eight metres above the ground, that really grabs all the attention. Built to negate overlooking neighbours, though the property is eye-catching, it has an intrinsic privacy to it, as well as an opulent and indulgent feel. Offering a complex dialogue of internal meets external space, bold architecture and design motifs that bad it into the surroundings perfectly, we think you'll have to take a few glances at these pictures, just to appreciate everything that is going on, so let's get started! The house is phenomenal enough, but when you add in a sweeping white structural element, you start to understand exactly how innovative and artistic this house is! 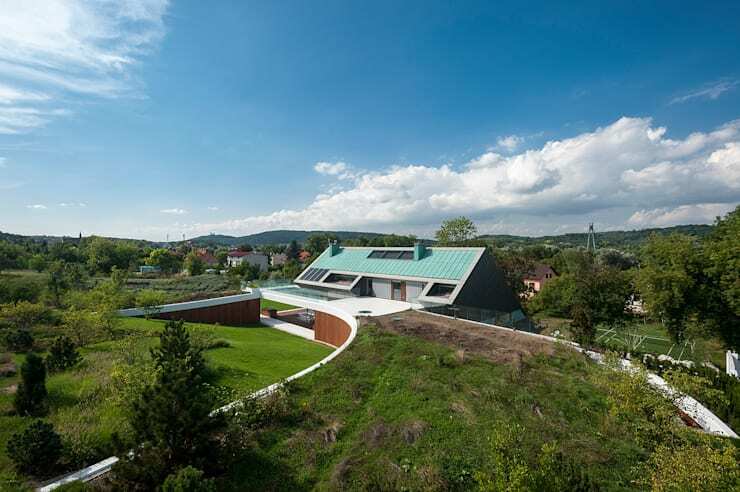 The living roof must be so beautiful, when admired from up on one of the expansive terraces. There's no getting away from the fact that this is a dramatic property, but the intuitive architects have managed to crate a natural sense of belonging, within the surroundings. 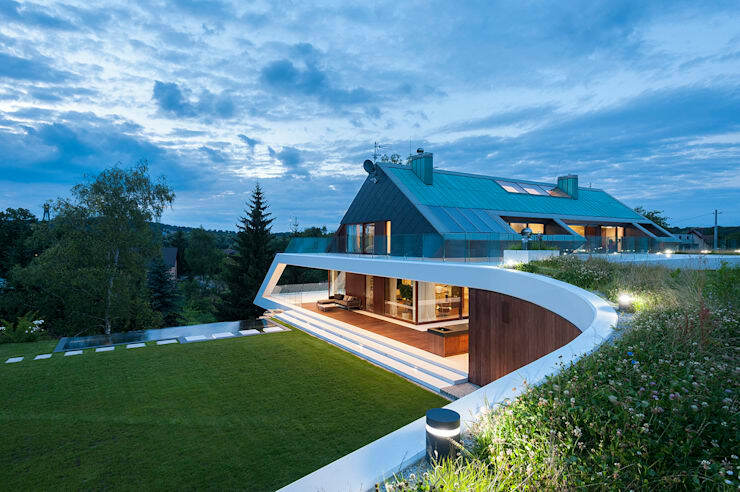 Living and green roofs certainly help, but so does the amazing multi-level design! Here is the reason for the name Edge House! From a distance, this could have looked like a standard pitched roof, but up close, you see that the entire home looks to have been built and tilted up on its apex! The way secret walkways have been created, behind the structure, and the sheer faces are just amazing. Is it just os, or could you imagine a Bond villain living here? That's no bad thing, as they always seem to have the best and most unusual lairs! From this angle, you can really see how the white structure encapsulates the entire house, offering a modernist motif into the mix. Let's see inside! The sheer scale of this interior is staggering. With gargantuan ceiling heights in place, there was no alternative but to enjoy an open-plan scheme, so as to really highlight them and using natural wood and white as the guiding colours was a genius touch. The home feels organic, welcoming and cosy, yet at the same time, almost over the top luxurious as well, but never boastful. Just beautiful! Large spaces, gorgeous designer elements and a simple décor style have really come together to make the most of this phenomenal home. 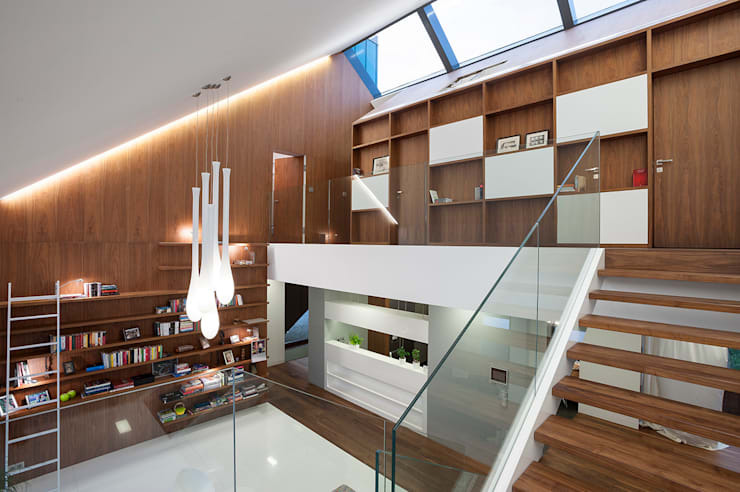 Integrated lighting has been so perfectly designed as well, to showcase the best elements and just check out how much light is pouring in through the stairwell! Just when you think this home has it all, it proves that it has even more! 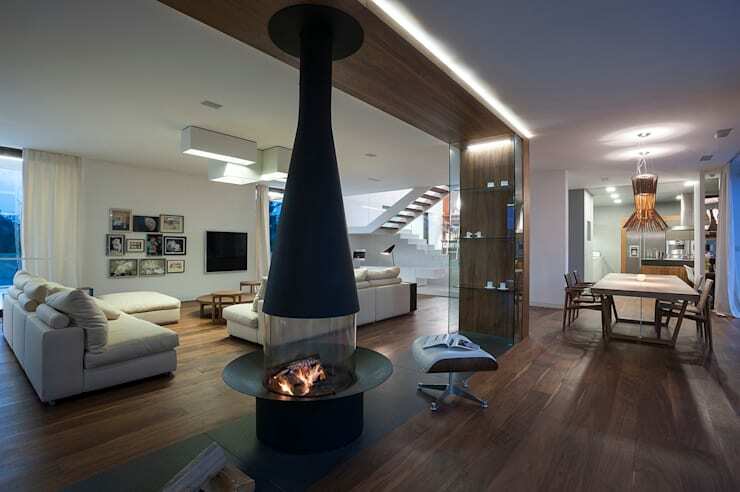 Leading off from the main living room is this charming terrace, complete with integrated fire and luxurious seating area. We are in love with how cohesive the exterior materials palette is, with the interior design choices. Of course there's a pool! 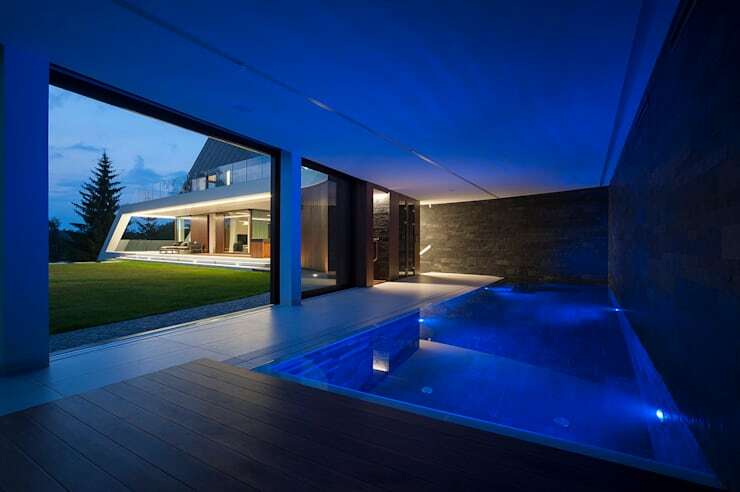 You didn't for one moment think that a house this incredible would have gone without a pool, did you? Even here, there is an easy and natural connection to the manicured gardens, giving the feeling of an outdoor pool, but with all the weatherproof elements of something more enclosed. The blue lighting really sets the whole area off as well, don't you agree? We could wax lyrical for hours about this house, but we won't, as there are many more to discover. We will, however, leave you with this fantastic final picture, which highlights the terrific angles and edges at play, as well as the stunning multi-level design. Would we live here? You bet we would! For more unbelievable home inspiration, take a look at this Ideabook: 50 shades of grey reveals a stunning family home. We'd live here, but the question is; would you?